Not really, and I don’t know the weather in which this text sets. I also spite every language teacher who clapped for me before such an introduction. I have always enjoyed weekends, those days I spent for years at the house of my grandfather. I know the amount of monotony lying within the last phrase, I remind myself of how “I should get a life as soon as possible”. The half torn, yellow-ish photos stood. They were miserable, they never had the opportunity to mess with the photographs, removing the traces of happiness clearly contaminating them. The wall library, the one I never understood; I have always wanted to explain to it what a failure it was, as the books of my grandfather have occupied every other cabinet, without getting any close to it, but libraries was another thing I was not good at back then, thus, I was satisfied by merely listening to the “Radio” occupying one of its corners, silently. 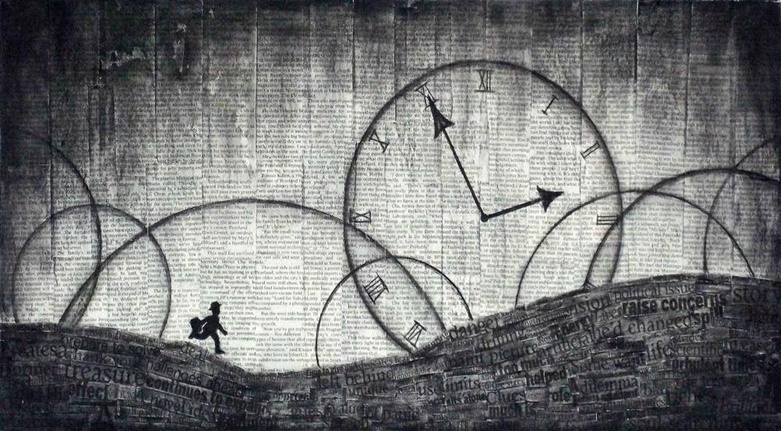 The relativity of time, the meaning of waiting. Those I have discovered early. The road from our house to the house of my grandfather is a long road that almost never ends. All those trees we ran into used to make me feel nauseated. I have always wished to burn them, to ruin them in any way. I am afraid of all these shades. I prefer the clarity of the sun. There I had earned the bad habit of reading – allow me to present my eyes a sincere apology, I love the two of you – as I had barely learned reading when my grandfather started to get me magazines and comics. Everything readable he kept in his room – which entering was more complicated than entering Lebanon today – and all I had to do was to wait for him to get back from work so I could get them. Years after working hard, I was able to get the privilege of entering the room on my own; my mother used to switch the key within the door. While I, I used to get in from everywhere, from the windows, from the small garden and the apricot trees. From the ventilation hole in the kitchen, racing every atom in the house, until I reached my weekly prize. I do not know a lot about travels. But the fifteen days that were supposed to separate me from seeing him once again have gone way too long. All this knowledge in the sciences of physics, astronomy, and math could not help me calculate the hours of the day he meant. All the tears I ran into while I searched could not ever convince me. The fault is probably in my wrist watch. I remind myself; I will repair it soon. You should stop looking for yourself in every letter I write, it is getting boring. And I should stop looking for your face among all this traffic. Let us go together, and let us get a life then. I hate all the old movie tapes. I hate that stupid turtle. I hate the sound it makes as it waits for food. I have always made up scenarios to get it over with. I hate the fifteen days. I hate the first handmade box I made. I did not understand why it was there in his room when it surprised me once as I was practicing my weekly breach. I hate the fact that someone is listening to the daily chatters of people on every mean of communication there is. He, too, should get a life. Today, the road led me there once more. I stood long staring at the space once occupied by the garden, and now occupied by some lousy landscape paving the way for an entrance. No walls separate the room, I can feel the chillness of the place from right here. I will not be able to enter from the windows today. Something pushes me into thinking that the news resident is well familiar with the language of libraries. I hate those who have a talent I don’t have. I should stop staring. I remember that the area has some security character to it now. And no text will ever justify my standing here, he too is not that good with language. I barely stepped away when forgetfulness sneaked upon me, smiling as we have the right to be before our friends and acquaintances. I rushed away from there, and I started screaming. Here lied the sitting room. Here stood the library. His room was there. All this glass is hurting me. The passersby gathered around me. I heard their whispers. It ended up with the owner of the place coming to me, asking whether I needed a glass of water, or to just sit down a little. Maybe. I asked him: Did anyone leave me a comic today? And I left him wondering in his silence, watching my steps away towards the next bus stop.